A five-finger discount is slang for shoplifting. It’s a funny way to describe this criminal action and a great way to introduce the subject of fingers. 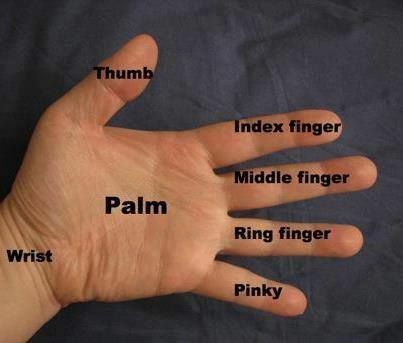 Do you know the names for each finger in English? The middle finger and the ring finger are easy to remember: the middle finger is the one in the center of all the fingers and the ring finger is the finger next to the little finger. On the left hand, it’s where the wedding ring is worn. The thumb, our thickest finger, comes from the Old English word, thūma, meaning thick. The index finger literally means pointing finger and originates from the Latin word index which means point (noun). The index finger is also sometimes called the pointer finger or the forefinger. The little finger is called the pinky because it comes from the Dutch word pink meaning the little finger.